UN Secretary General Kofi Annan has presented a final plan to end Cyprus' 30-year split, calling it a compromise that does not meet all demands. 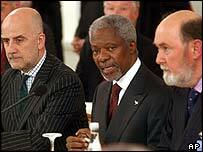 Mr Annan said he believed, however, that it addressed the key concerns of both the Greek and Turkish communities. The UN plan will be put to both sides in referendums on 24 April - and if either side rejects it, EU membership will in effect apply only in the Greek part when Cyprus joins on 1 May. First indications are Greek Cypriots will turn down the plan. The BBC's Tabitha Morgan, reporting from the capital, Nicosia, said attitudes appear to have hardened among them. the continued presence of Turkish troops in Northern Cyprus. "This is a moment of high drama," Mr Annan said as he announced the plan in the Swiss mountain resort of Buergenstock. He said there had been "too many missed opportunities in the past" and that Cypriots now had a choice between the UN settlement or no settlement at all. However, the plan now provided "a secure framework for a common future". He told both sides: "Let us seize this chance for peace in the united republic of Cyprus." Greek leaders expressed concerns about the plan but welcomed the referendum. Prime Minister Costas Karamanlis gave only a brief reaction to reporters after Mr Annan's presentation. "Unfortunately it was not possible to reach an agreed settlement," he said. "It is now up to the people of Cyprus to reach a decision and I hope they will do this with clear thought and vision." Turkey's Prime Minister Recep Tayyip Erdogan gave a strong signal that Turkey would support the plan. "I want to be very open and clear to you," he told reporters. "We set on this road with goodwill. And we want to see the result of this." The BBC's David Bamford at Buergenstock says both leaders' reactions were given in enigmatic terms. He said that while Mr Karamanlis does not support much of Mr Annan's plan, both he and Mr Erdogan do agree that the final decision should be made by way of referendum. Mr Annan has acknowledged that peace is only possible on Cyprus if the Turkish Cypriots can be assured there will not be a sudden rush of majority Greek Cypriots into their northern enclave, says our correspondent. The plan envisages a federation of two states - one Greek and the other Turkish - with a loose central government, on the Swiss model. It allows fewer refugees to return to the Turkish north and specifies that Turkey will be allowed to maintain a military presence on the island indefinitely. The 9,000-page document was presented to the negotiators at a formal ceremony on the shores of Lake Lucerne earlier on Monday. Cyprus has been split into the Greek Cypriot-controlled south and the occupied north since Turkey invaded in 1974, following a short-lived coup by supporters of union with Greece. The breakaway north is only recognised by Turkey. "Turkey and Greece have their reservations about the agreement"